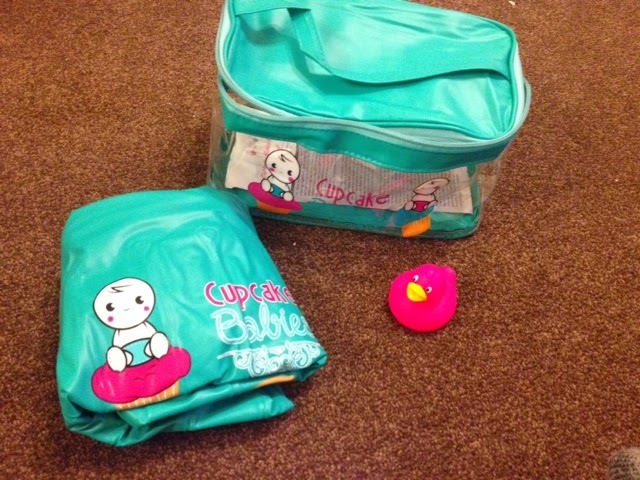 You may remember me briefly mentioning Cupcake Babies in my post following The Baby Show. 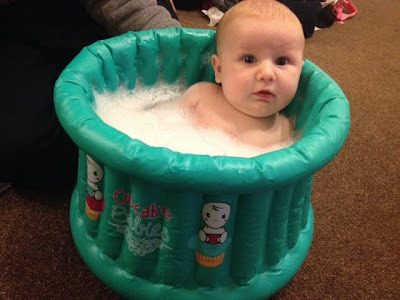 The smallest baby bath in the world, revolutionising bath time. The Cupcake Babies bath is inflatable and so takes up next to no storage space. It can be placed in most sinks and surfaces allowing you to bath your baby however feels comfortable for you. Each bath folds up small and is stored in a small plastic bag it also comes with a cute little rubber duck. Perfect for those who travel regularly or have storage issues. Designed to look like a cupcake it would even make a perfect photography prop! 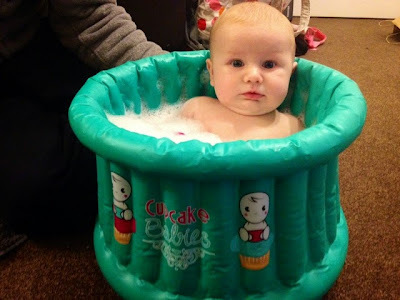 Aimed at babies 0-12 months, the Cupcake Babies bath is a great alternative to your usual baby bath. As well as being handy and innovative, it is also economical. The size means that it doesn't use up a large amount of water to fill it. I use a washing up bowl 3/4 full and as you can see that is more than enough water. It is much sturdier than it looks. Elsie is obviously not sitting unaided yet so in these pictures we supported her by holding the bath at the back to prevent it tipping over with her weight against it but the material itself is pretty thick and not flimsy. The only negative I can think of is I wish it was slightly wider. Elsie fits perfectly and will do for a long while but I think if it was a bit larger it would definitely get a few more months (more than 12 months) use out of it. Elsie is definitely a water baby, She loves her baths and is instantly relaxed the moment she hits the water. I can't say there is a bath I've found that she hasn't been comfortable and happy in. She loves the Cupcake Babies bath just as much. I guess it totally depends what you are looking for in a baby bath. If you are content with a cheap baby bath that is fine. If you are worried or overwhelmed with the amount of space all your baby items/essentials take up then this could well be the perfect solution for you. At £39 it isn't cheap but it could be a fantastic investment.